A beautiful example of mid-century design, these earrings date from the late 1950s and were created in the USA by Robert. These gilt metal earrings feature a filigree floral design set with teardrop, oval and round clear rhinestones. All of the stones are faceted and claw set. They are clip on and signed on the reverse of each clip with 'Robert' in script lettering. They measure 3.25cm x 2.25cm. To learn more about Robert Originals jewellery visit our 'Designers' section. These earrings are the epitome of mid-century glamour. Not only are they evocative of the cocktail style popularised in the 1950s - evidently fake, but nontheless elegant - they represent the influence of nature upon fifties jewellery. Indeed, couturiers, such as Dior and Balenciaga, were heavily influenced by floral motifs and it is no surprise that jewellery manufacturers like Robert were producing pieces that echoed Parisian trends. 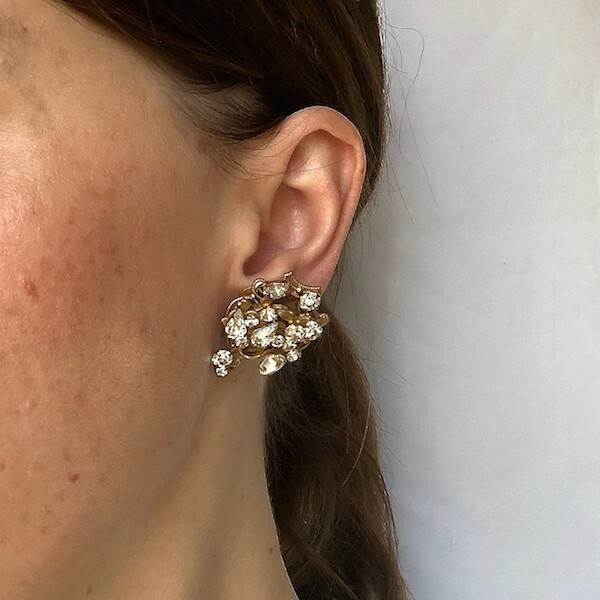 These earrings are the ultimate vintage bridal accessory - wear them with a floral lace gown to compliment the gilt metal flowrs in the earrings.